Circus Vargas clown, Brian Angel Mota begins his transformation into "Brian the Dreamer," one of the lead performers in their production of "Dreaming of Pirates." 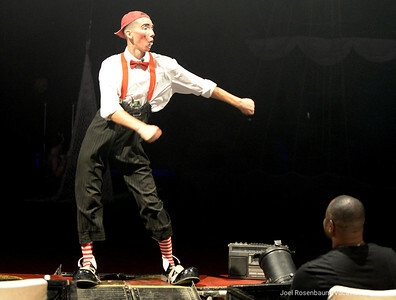 Mota a portrays a clown who dreams of becoming a pirate and at the end of the show realizes that dream. 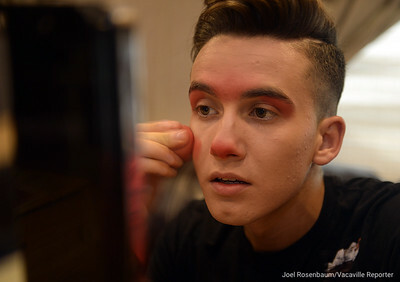 Mariella Quiroga, 20 applies her makeup before stepping into the big top to perform in Circus Vargas' 2018 production, "Dreaming of Pirates," Thursday in Fairfield. Quiroga has followed in her parents footsteps by becoming a trapeze artist with the show. 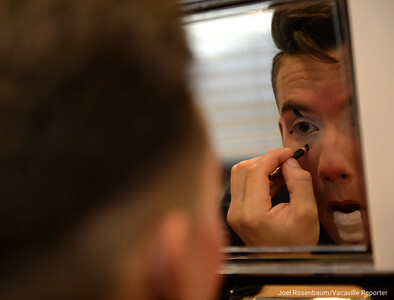 Brian Mota and Mariella Quiroga apply their makeup as they get ready to perform during opening night of Circus Varagas' shows in Fairfield. 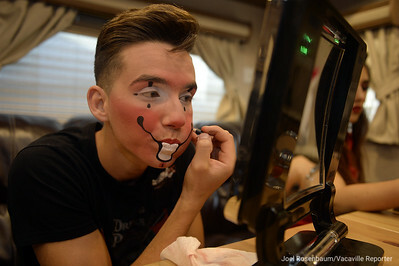 Circus Vargas clown, Brian Angel Mota puts the finishing touches on his makeup before Thursday's opening night performance in Fairfield. Mota who grew up in circuses around Europe with his parents and uncle who are also circus performers. 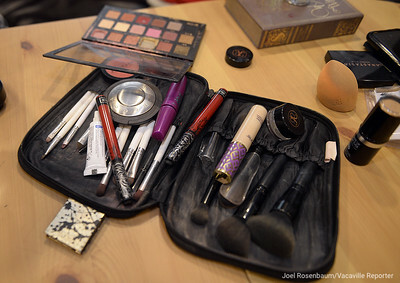 He says that he drew his inspiration for his makeup by looking at his uncle, who is also a clown and going through a lot of trial and error. In the end he said, "You have to find your face." 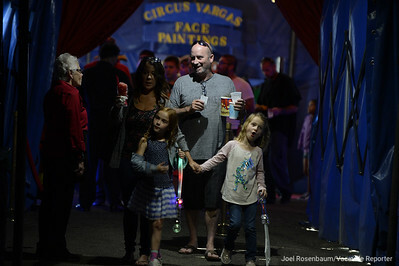 Circus fans line up to get into the Circus Vargas big top for Thursday's opening night performance in Fairfield at the Solano Town Center. Using scarves. 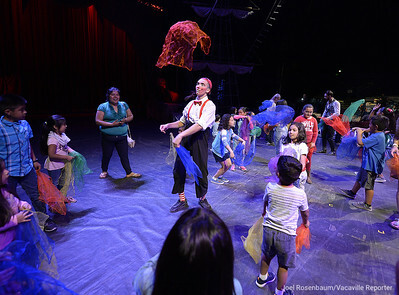 Brian Mota show kids how to juggle during a pre-show workshop Thursday. 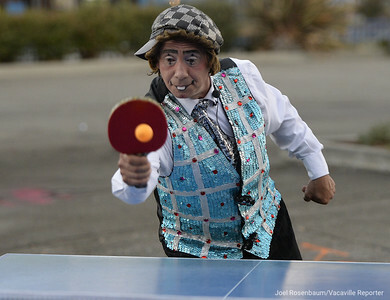 Circus Vargas clown clown, Johnny Valentin blow off some pre-show steam by playing a friendly game of Ping-Pong. 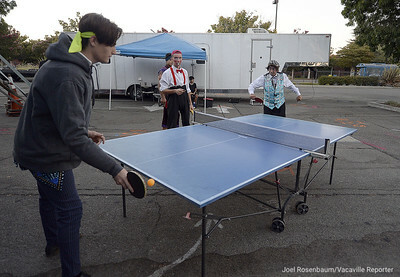 Circus Vargas performers, tightrope walker, Steven Fererri and clown, Johnny Valentin blow off some pre-show steam by playing a friendly game of Ping-Pong. Mariella Quiroga strikes a pose during the opening production number of CIrcus Vargas' production of "Dreaming of Pirates." 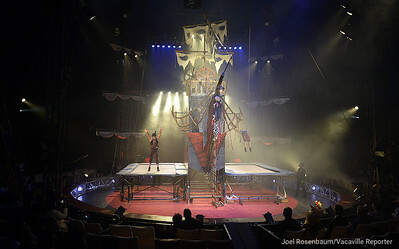 Circus Vargas acrobat, Annabel Bachliyski performs her aerial routine from a chandelier hanging from the top of the circus tent during Thursday's opening night performance of "Dreaming of Pirates." 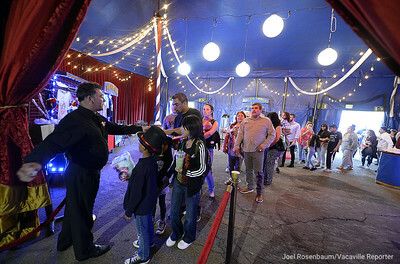 Circus Vargas clowns Miguel Mota (left) his brother, Johnny Valentin and his son, Brian Mota perform their routine, "one-two punch to the delight of the fans inside the big top during opening night Thursday in Fairfield. 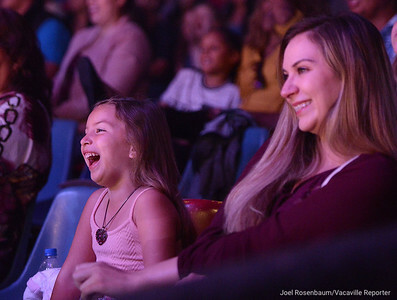 Alaina Anchante, 5 (left) and her mother, Erica of Vacaville laugh at the antics of the Circus Vargas clowns, Brian Angel Mota, his father Miguel and uncle. 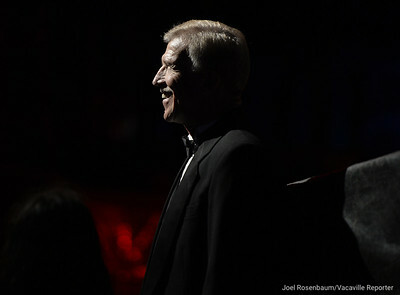 Johnny Valentin during opening night Thursday in Fairfield. 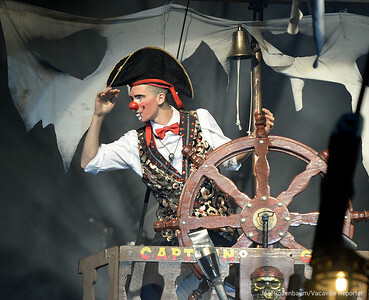 Brian Mota mans the wheel of the pirate ship during the opening number of Thursday nights performance. Circus Vargas owners, Katya and Nelson Quiroga watch the opening night performance from the wings. 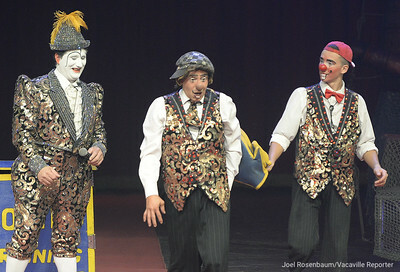 The two started out as performers in the show as trapeze artists and then purchased the company in 2005. 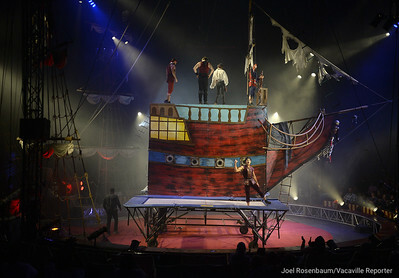 Circus Vargas acrobats perform stunts on trampolines placed below a pirate ship in the center ring of the big top during the Thursday's opening night show in Fairfield. Brian Mota dances during first act. 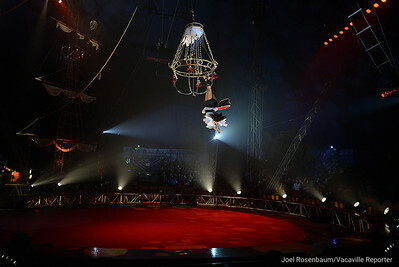 Circus Vargas trapeze artist and one of the lead pirates, Mariella Quiroga watches the show's first act from the wing. Brian Mota prepares to join his father, Miguel (rear) in the ring during first act. 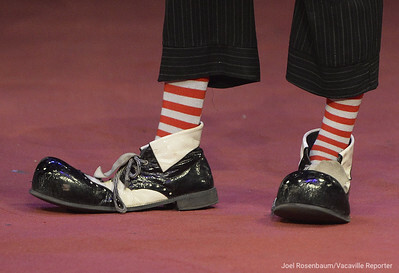 Brian followed in his father's footsteps and became a clown. 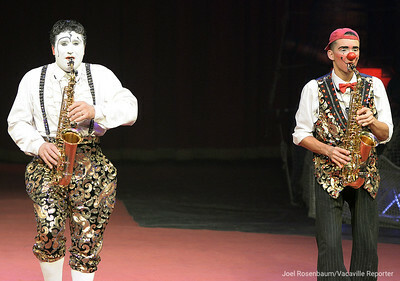 The two joined Circus Vargas this year after working for years in Europe. Sisters Daniella (front) and Mariella Quiroga perform a contortion routine during the first act of Circus Vargas' production "Dreaming of Pirates" Thursday night in Fairfield. The sisters have grown up in the circus following both their parents and grandparents into the show. 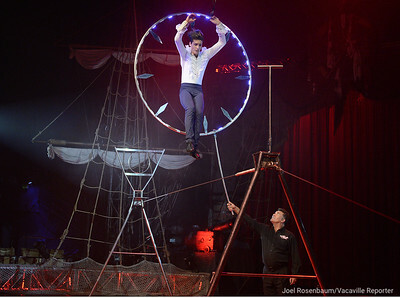 Steve Fererri jumps through a large hop as he performs his low wire act during the first act of Circus Vargas' production of "Dreaming of Pirates," Thursday in Fairfield. 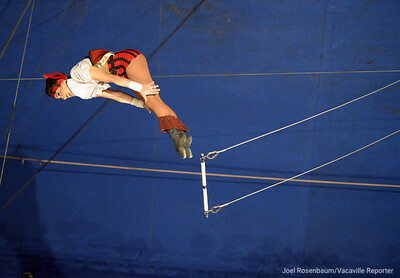 Circus Vargas' Mariella Quiroga soars through the air as she performs on the trapeze during Thursday's night's show. Quiroga grew up watching her parents perform in the circus.